Nice set up.... what do you make/build with those? stuff.. what do you make with yours? Mostly for model building, but I've got some full size stuff going as well. Working on an adapter to run small engines on Propane, without changing/modifying the "can't get parts or replacement carbs" carb. I see you have the riser blocks on your lathe. Did you do the column extension on the mill. I did and it helped. but have not done the riser blocks on the lathe. 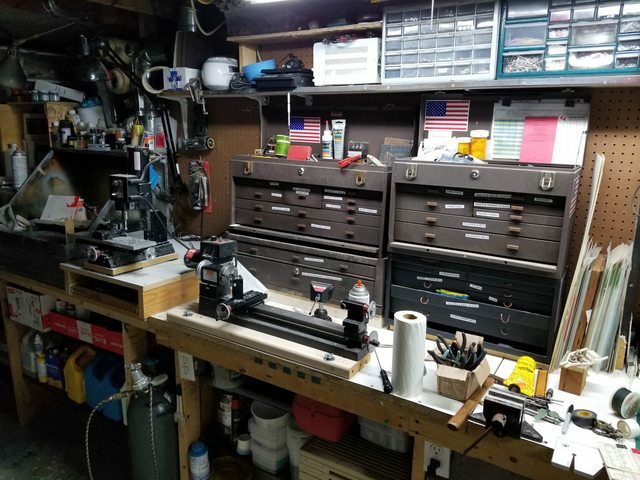 Of course I now have 10x24 lathe, and RF-30 style mill to use doing larger items. I haven't needed to extend the mill height (yet). But it's on my list of stuff to get at some point. Looking at the bench and part or tool boxes, made me think the post is showing a sort of hobby or scale model building operation. Which I love to see, could also be big into clock building, who knows? I'm always interested is what folks use their machines for. I get the impression sometimes, right or wrong, that quite a few collect dust. Duplicating scale replicas of anything takes an extreme amount of everything, patience, talent and fortitude. As does with any raw materials a machinist turns into a completed working, whatever. I agree, and the smaller the model, the harder it is. I have no idea how someone can make something so small that my 3.0 reading glasses still have trouble picking up the detail on. Add to that a magnifier and still I struggle...... How do they do that.